"The height and extent of the central aisle fill the mind with sensations of wonder and sublimity. 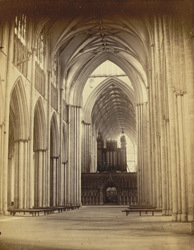 Looking to the east is the stone screen upon which is placed the organ designed by Dr. Camidge, of York; while beyond it appears the great east window pouring into the choir its immense flood of light. Lately a new effect has been produced by having the nave illuminated with gas during divine service, which, at stated periods, is held in the great nave. A gas pipe runs round the pillars above the capitals, with jets on every side, which have a very gorgeous appearance when lighted up at night. The nave and transepts are open to the public daily from 10 A.M. to 5 P.M."